Hit the waves with some of the most popular day tours in the Whitsundays! 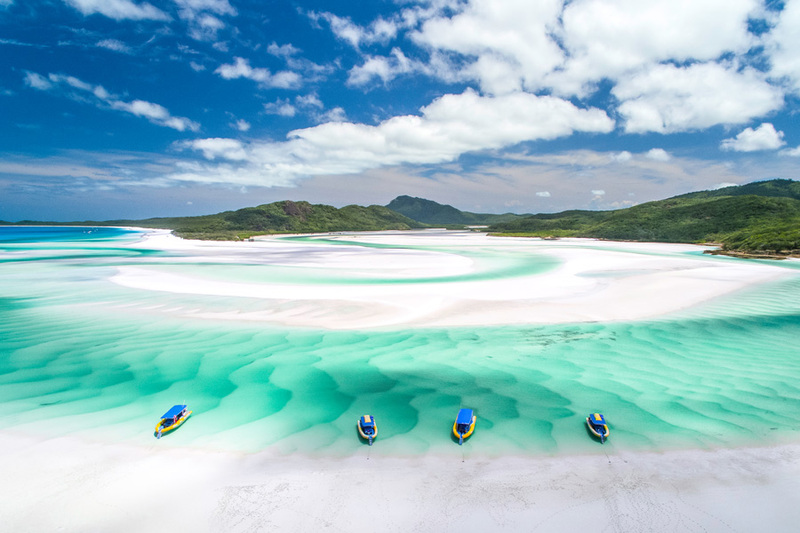 Spend one day rafting around the Whitsunday Islands! Opportunity to see turtles, dugongs and more! Options to choose from depending on wants! See marine life up close! Enjoy a full day on the water with Ocean Rafting's Northern Exposure Tour. This snorkel and beach tour is a great way to see the best of the Whitsundays with a stop at Whitehaven Beach and Hill Inlet Lookout as well as two different snorkel stops. You will cruise around the Whitsundays on board Ocean Rafting's fast raft for an experience in itself! The next day, you will get to enjoy a leisurely ride around the waters of Airlie Beach with Whitsunday Jetski Tours' Airlie Adventure. The tour is both relaxing and exciting at the same time and is a great place for spotting turtles and other wildlife! Ideal for ages 8 and up. Combo 2 offers a choice between Ocean Rafting's Northern Exposure or Southern Lights - two tours that explore the Whitsunday Islands. They leave at different times of the day, both offering snorkelling and a stop to the famous Whitehaven Beach, but Northern Exposure has more snorkelling, while Southern Lights has more time at the beach. The next day explore even more of the Whitsunday Islands with Whitsunday Jetski Tours Two Island Safari. This tour will have you exploring the waterways of South Molle Island and Daydream Island, where you can keep an eye out for turtles, dugongs and more amazing wildlife. All riding apparel including tops, sunglasses/goggles and hat and safety gear. Ocean Rafting has prescription masks available for hire for $15.00. Soft drinks and snacks also available for purchase on board. All departures and itineraries are subject to weather and may be changed or canceled at the discretion of the tour operator. It should be noted that adventure travel involves risk. Whilst we make every effort to safeguard clients, we cannot be responsible for personal injury or loss due to actions of our clients which are beyond our control. We recommend that all clients have travel insurance covering illness, injury, loss or damage to personal belongings or not being able to travel on the confirmed date of departure. Please be aware operators pass on credit card merchant fees so there is a non refundable 2.5% surcharge for VISA and MASTERCARD card purchases. For Whitsunday Jetski Tours, minimum age for drivers is 16 years of age, while passengers must be 8 years old for the Airlie Adventure tour or 12 years old on the Two Island Safari. All client cancellations forfeit 25% of total ticket price and all client cancellations made less than 7 days prior to departure will result in complete forfeiture of the full price of the sailing holiday. If the sailing company has to cancel the trip (prior to the boat's departure) and we cannot offer a suitable alternative, then a refund will be given, minus card fees. We strongly recommend that you have travel insurance especially during the wet season.